The evening started with the networking of about 40 women from different organizations, introducing themselves, exchanging greetings, thoughts, etc. 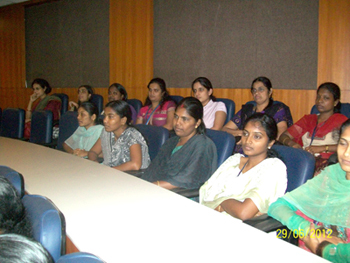 Ms. Kalyani, President of eWIT flagged the event with a welcome speech and a briefing on eWIT and its activities. Ms. Rajini Reddy, Exec Committee Member of eWIT to introduced the Role Model of the evening. Introducing Ms. Latha Rajan of Ma Foi Strategic Consultants, Ms. Rajini briefed the audience on her accomplishments as a person and as a co-founder of Ma Foi. Ms. Rajini then invited Ms. Latha Rajan to the on the dias to take over the session. Ms. Latha Rajan started with a presentation of the good old story of The Hare and the Tortoise whose moral was ‘Slow and Steady wins the race’. But Ms. Rajan shared that this was not true all the time, especially in today’s world. Now, the motto should be ‘the fast and consistent win the race’. She ended the story with the moral that we need to work together to win and be satisfied. She briefed the audience on her journey since 1992, when she started Ma Foi with her husband. She related the challenges she faced. She said that one needs to understand his/her strengths and weaknesses; identify core competencies and work hard to bring out the same. When there is a failure, working harder and changing the strategy might be fruitful. She advised that we need to compete against the situation and not against the rival. 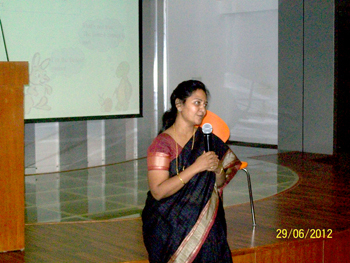 She then briefed the audience on how HR activities rose to prominence in India. It was the IT boom that not only made HR prominent, but also placed India on the global map. Talking about building support networks, she said life is not an individual game and people around us are different from each other. Working together with different people in different situations is very important. She stated that taking care of oneself, self nurturing, networking, spending time with children is as important as our careers. She finished her speech with an advice - keep experimenting and keep trying new things in life. The evening ended with a thank you note by Ms. Jayalakshmi of Ascenders Technology and Exec Committee member of eWIT. The venue of the event was hosted by Exemplarr Worldwide, a corporate member of eWIT.